Based on original research, this first volume of a set of groundbreaking new books sets out a framework for analyzing sustainable urban development and develops a set of protocols for evaluating the sustainability of urban development. Protocols included are for sustainable urban planning, urban property development, urban design, the construction, operation and use of buildings. 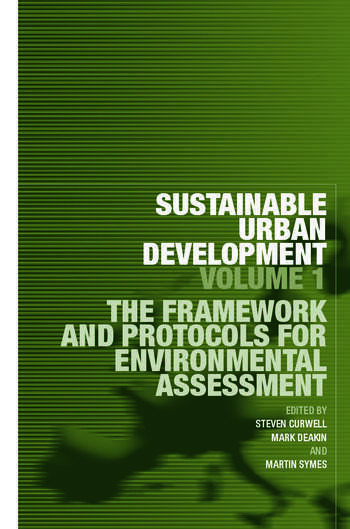 Using these protocols, the book goes on to provide a directory of environmental assessment methods for evaluating the sustainability of urban development and also maps out how these assessment methods are being transformed to evaluate the environmental, economic and social sustainability of urban development. Web-based applications are increasingly being used to support this transformation and the contributors deftly cover this application and issues concerning the use of information and communication technologies for evaluating the sustainability of urban development are also dealt with. With its multidisciplinary approach, Sustainable Urban Development presents key new material for postgraduates and professionals across the built environment.